Please join us at Slo Curio for April First Friday opening reception of Art of Adornment featuring the incredibly talented Colorado multimedia artist Sabin Aell, an original RiNo artist with a rich creative history in Denver. 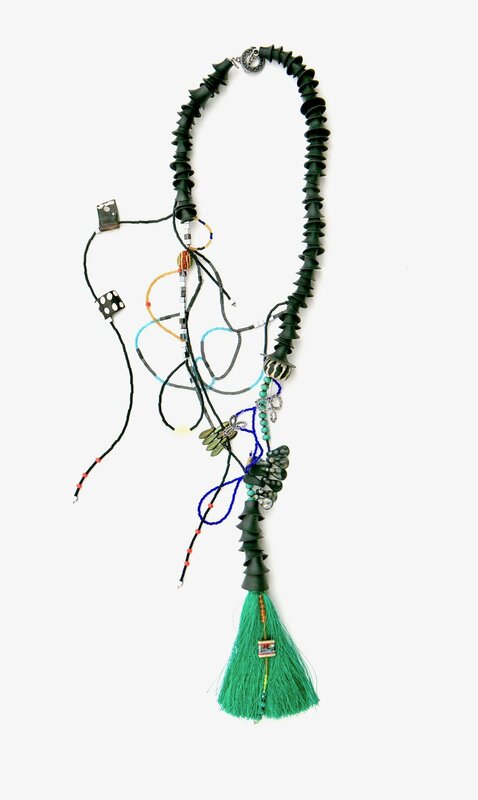 Art of Adornment is a collection of Sabin’s one-of-kind wearable art made from found objects she fashions into a road less taken in jewelry design. Her pieces are complex & thought provoking as each twists & turns in shapes, lines, colors & textures that flow into a viaduct of imagination. Primordial & powerful yet incredibly modern, Sabin’s adornments evoke the goddess in the wearer & makes for a stunning art display both on & off the body. Come join us & meet this warm & friendly artist while enjoying complimentary refreshments between 6-9pm on April 5th, 2019. Art of Adornment will be on display at Slo Curio throughout the month of April 2019.